As part of our monthly updates, we have updated the regular indicators and also added a few brand new ones too. New data has been published on the total proportion of teenage mothers (under 18). This is the first time that this data has been available at small area level. The figure is calculated by taking the total number of maternal episodes for a mother aged between 12 and 17 years as a proportion of all maternal episodes. Data is sourced from Public Health England – Local Health Profiles. New data is has been published on Disability-free life expectancy (DFLE) for males and females. DFLE is the average number of years that an individual might expect to live free from a limiting persistent illness or disability in their lifetime. Data is sourced from Public Health England – Local Health Profiles. Net weekly household income estimate (equivalised to take into account variations in household size) with breakdowns by income before and after housing costs. These figures are model-based estimates, taking the regional figures from the Family Resources Survey and modelling down to neighbourhood level based on characteristics of the neighbourhood obtained from census and administrative statistics. The most recent data is for 2013/14. New data on concentration of jobs by broad industrial use case and proportion of full time and part time jobs have been added to the system. Data is collected from the Business Register and Employment Survey (BRES). 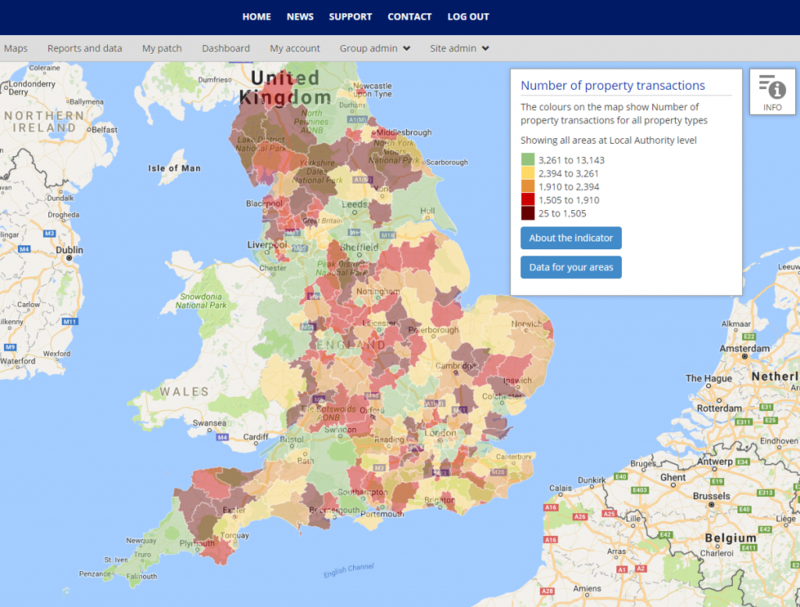 This new indicator shows the number of property transactions over the last 12 months. This is broken down for all property types. Data is from the Land Registry. To find these new indicators go to the Unassigned theme, on the Manage Indicators page, search for the following keywords: teenage, disability, income estimate, sector and property transaction. If you need a reminder of how to add new indicators to your maps and dashboards, check out this article in our Knowledge Base. Crime indicators include crimes for 14 key offences (anti-social behaviour, burglary, bicycle theft, criminal damage, drugs, violent crime, vehicle crime, possession of weapons, public order offences, theft from a person, other theft, robbery, shoplifting, and other offences). Data is available for the time period up until November 2016. Data is sourced from Police UK. Benefit data including: Unemployment Benefit; with both JSA and Universal Credit broken down by age and gender. This data is published monthly and will reflect the time period of December 2016. The idea for two of these new indicators came directly from Community Insight users. If you have some suggestions for new indicators, then let us know on support@ocsi.co.uk. Provided that the indicator is open data and available at LSOA level then we will add it in to Community Insight.